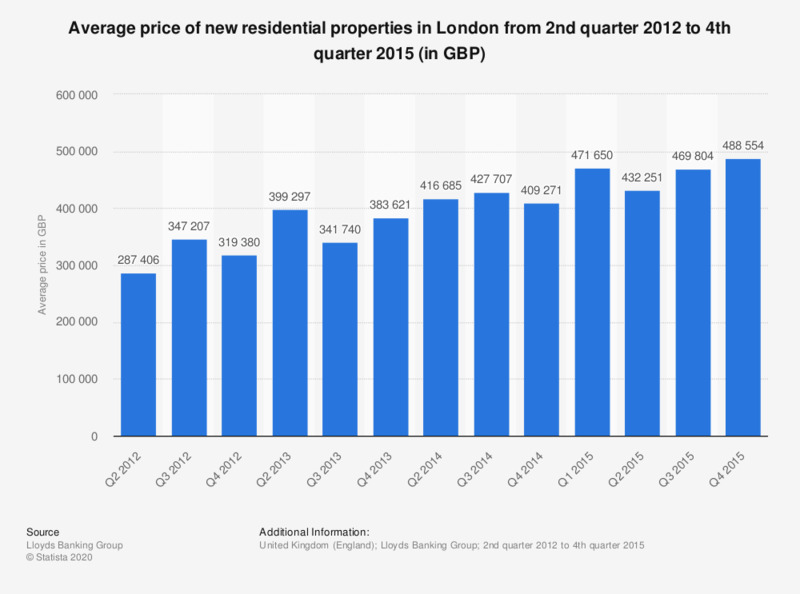 This statistic shows the average price of new residential properties in Greater London (United Kingdom) from the second quarter of 2012 to the fourth quarter of 2015, according to the Halifax house price index. In the fourth quarter of 2014, the average price of a new residential property in Greater London was 409.3 thousand British pounds (GBP). The price grew to the level of 488.2 thousand GBP by the fourth quarter of 2015. This statistic includes the following residential property types from the primary housing market: terraced, semi-detached, detached, bungalows, and flats and maisonettes. The source doesn't provide information about first quarters of 2013 and 2014.